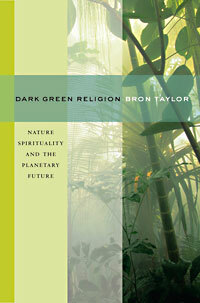 Bron Taylor, editor of the groundbreaking Encyclopedia of Religion and Nature, offers here his understanding of "Dark Green Religion"--a form of spirituality that relates to the natural world as a source of awe and wonder, a repository of sacred value, and an encompassing reality that calls on us for connection and protection. This movement is distinct, Taylor argues, from religious environmentalism--the current movement of the world's "major" religions towards ecological sensibility and responsibility. It is not established religious traditions that are at stake, but rather nature itself--understood throughout the movement with varying degrees of emphasis on individuals or the system as a whole, and varying degrees of supernatural spiritual embodiment or naturalism. Taylor begins by examining some current exemplars of this kind of nature spirituality (e.g., Joanna Macy, Gary Snyder, Aldo Leopold, James Lovelock) and then, in greater detail, its crucial nineteenth century forbears: Emerson, Muir, and most importantly Thoreau. (As the author presents it, there is little if any continuity with pre-modern earth religions; either those of indigenous peoples or of the marginalized currents of Wicca.) He then moves on to a wide variety of contemporary cultural and geographic contexts, including nature spirituality among surfers, Disney movies and theme parks, activist radical environmentalists, scientists, literature, photography, and large-scale international environmental meetings. It is remarkable to see, concentrated in one book, the enormous similarity of attitudes towards nature among all these disparate individuals and groups. Over and over we hear: "Nature (or life, or the earth) is sacred, it sooths and ennobles us, we depend on it, we are part of it, we must protect it." Dark green religion centers on a sense of the inherent value of nature, and a corresponding rejection of the anthropomorphically assumed special moral status of humanity. This sense of the absolute worth of the natural world is perhaps the key to distinguishing dark green religion from a purely aesthetic enjoyment of "wilderness" or the way Abrahamic religions value nature as a sign of God’s power and generosity. For dark green types, nature is not a sign of Something Else, or something to be valued just because it's a lot of fun. It is an autonomous Presence that is at once sacred and kin. Dark Green Religion is intelligent, well-written, and very much worth reading. Taylor's personal encounters with a number of his subjects enrich the text rather than distract from it; his initial decision to employ a flexible and open-textured attitude towards what constitutes a "religion" keeps him from wasting time on quibbles of definition; and his overall argument is completely sound: a deep sense of love, respect, awe, and ultimate importance, connected to widely respected key texts, honored teachers/elders, and moral imperatives, simply is a religion. The book raises some very interesting questions. First, as a more conventionally religious person might say the she or he is essentially a child of God or a soul, the dark green faithful think of themselves as essentially natural beings. Their religious identity unfolds in abstraction from their social identity. It is not as Americans, Lebanese, Republicans, Muslims, etc. that we are part of nature, but as mammals, oxygen users, and products of evolution. Like the positivistic reduction of humans to physical/scientifically describable properties, this identification leads to a certain amount of conceptual difficulty: for humans are unlike any other natural being in that we go around telling each other what we really are and why it is important to be what we ate rather than to fail to be what we are—something nothing else in nature could ever do. The verbal, hence cultural and historical, mechanism by which we ascribe a dark green religious identity to ourselves thus exists in some tension with that identity. While Taylor efficiently dismisses many common criticisms of nature spirituality (that it is misanthropic, that it is not "really" religious because it doesn't involve belief in the supernatural, that it is unChristian) he does not seriously confront one which would accuse at least some of the faithful (for example, surfers) of self-indulgent aestheticism; or others (like the corporations that use Gaian imagery in their ads) of hypocritical exploitation. Like the production of all the Disney nature movies (and of course all the books written by people like Taylor and myself) surfing involves destructive forms of industrial production and pollution. While this is a dilemma faced by virtually all environmentalists, there is a dramatic difference between a religious attitude which seems to ignore it (drive to the beach, ride the waves, feel good, drive home, etc.) and one which, as in the case of the radical environmentalists or ecological NGOs the book describes, are actually living the deeper tenets of the religion. In this a dark green faith may simply bear out the old adage that religion makes a good person better and a bad one worse. If some dark green types are inconsistent phonies, so are many of the world's Christians, Muslims, Jews or whatever, not to mention a probably equal percentage of the world secular socialists, radical feminists, believers in human rights, and, liberals. Any religion worth its salt, just like any serious secular moral code, demands a great deal of us, and most of us frequently don't live up to what we profess. Yet a little more attention to this issue would have enriched Taylor's book. In more general terms, neither Taylor nor many of his subjects confront a serious question about the practical meaning of this religion. Respect for life, the earth as sacred, humans as "plain citizens of the biotic community"--what does all this mean for our current way of life? What should we give up? How much is enough and how much is too much? There are also strategic questions. Can any of this be done while the world economy and culture is dominated by multinational corporations, militarism, and the drive for ever more consumption? If it can't, what kind of political movement does dark green religion envisage not just to save this Redwood or that beach, but the sacred earth as a whole? Of course in not having a settled answer to these questions dark green religion manifests what is a typical religious problem--moving from ethical values to the political movements capable of making those values actual. And given the prominent role of nature spirituality in environmental organizations, dark green religion is probably more sophisticated and committed politically than any other religion. Also, what does it mean that an object of reverence, nature, is in some sense under attack-from ironically, the very technological powers that may partly undergird nature spirituality itself? The great advantage of religion is often the comfort it brings, a comfort based in the notion of an all-powerful personality to whom we can turn or a universally valid method of enlightenment which we can practice. Yet nature, or at least the earth, is in rough shape. There is no guarantee that it will pull through in anything like its present, already severely compromised, form. What kind of religion can worship and feel fear and pity for the same Reality? Questions for Taylor, and doubtless the adherents of the brave new faith, to respond to in whatever time we have left.